The Febreze Set and Refresh works by allowing scented oil to pass through a porous membrane that is then released into the air. The unit is easy to assemble. The scented oil pouch simply slips down into the holder. To control the amount of scent just pull up on the unit. This will open more holes to release the scent. Available in a variety of scents: Hawaiian Aloha, Thai Dragon Fruit, Apple Spice and Delight, Spring and Renewal, Meadows and Rain, Linen and Sky. No plugs or batteries are required with the Febreze Set and Refresh. Designed to provide up to 30 days of freshening. With its adjustable base, Febreze SmallSpaces gradually releases the amount of scent you choose. Febreze Set and Refresh doesn't require batteries or electricity; it provides automatic freshening. Febreze Set and Refresh has six scents to choose from. With its small size, Febreze Set and Refresh fits in any space. Lasts significantly longer than cones do. Eliminates tough odors as opposed to simply masking them. Some consumers have had trouble figuring out how to assemble the unit. When Febreze sent me their Febreze Set and Refresh Air Freshener to try, I was immediately struck by how small the unit was. I wasn't expecting much in the way of scent power, but this little unit can really freshen a room -- the scent really works! With only two pieces, the unit is simple to put together. Slide the piece with the scented oil in it into the plastic holder piece; no need to open or peel anything. And because of the small size of Febreze Set and Refresh Air Freshener, it fits anywhere in your home. I don't like the fact that Febreze isn't currently making refills, but the product does a great job for the money. Because there is no opening for the oil to pour out, you won't have to worry about spills. The unit is also small, about 3 x 4 inches, which makes it easy to add to a room inconspicuously. Despite the small size, the scent is plenty powerful. It works well in bathrooms, laundry rooms, mudrooms and dorm rooms. Also try it in hampers, under sinks and near shoes in closets. It seems like most air fresheners either need to be connected to an electrical supply or manually sprayed to end up freshening an entire room. Run out of batteries or forget to spray, and the scent fades. However, Febreze Set and Refresh is an automatic air freshener that doesn't need batteries to freshen a room. 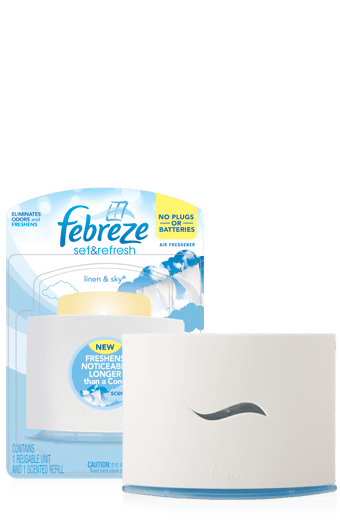 The Febreze Set and Refresh is designed to last for up to 30 days. Though there aren't any refills, some units do come packaged with two scented oil packets and one holder unit.